Marketing is critical to growing your book of business, but technical and regulatory hurdles can keep you from engaging more with clients. SmartOffice’s integration with MarketingPro can help! Prewritten, Approved Content: Send personalized articles, newsletters, social media posts, and other content written by pros and reviewed by your broker-dealer. Contact Export & Sync: Export contacts from SmartOffice to MarketingPro and keep them up-to-date with automatic sync. Scheduling & Automation: Set up print and e-mail campaigns that run by themselves. Compliance: Archive your communications and track them in the SmartOffice SmartPad. 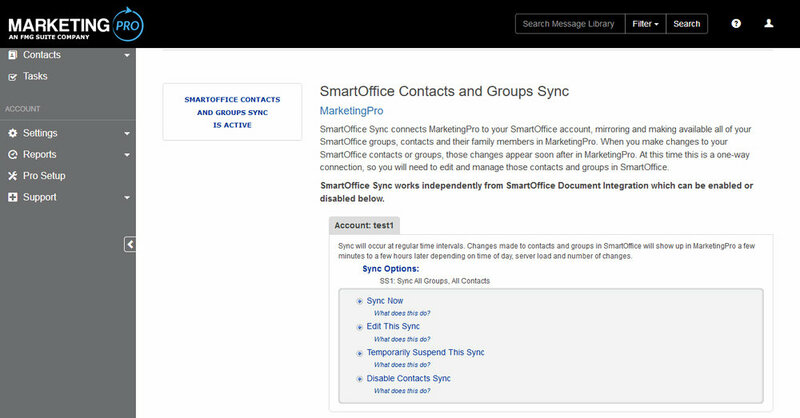 Control the synchronization of your SmartOffice contacts and sets using MarketingPro’s sync settings page. Use the Message Builder to personalize prewritten content from MarketingPro’s extensive library, select your SmartOffice contacts and send it. Get complete analytics on the success of your marketing campaigns using MarketingPro’s reports.